Suzanne Scott is an assistant professor in the Department of Radio-TV-Film at the University of Texas at Austin. 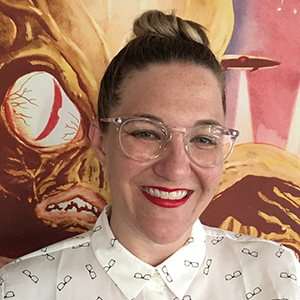 Her research and teaching interests include fan studies, media convergence, digital and participatory culture, social media, transmedia storytelling, comic book culture, and gender studies. She comes to Austin after previously teaching Film and Media Studies in the Department of English at Arizona State University, and serving as a Mellon Digital Scholarship Postdoctoral Fellow in the Center of Digital Learning + Research at Occidental College. She has taught undergraduate and graduate courses at UC Santa Cruz, UCLA, and the University of Southern California. Dr. Scott’s scholarly monograph, Fake Geek Girls: Fandom, Gender, and the Convergence Culture Industry (NYU Press, 2019), considers the gendered tensions underpinning the media industry’s embrace of fans as demographic tastemakers, professionals, and promotional partners within convergence culture. Surveying the politics of participation within digitally mediated fan cultures, this project addresses the "mainstreaming" of fan and geek culture over the past decade, how media industries have privileged an androcentric conception of the fan, and the marginalizing effect this has had on female fans. She is also the co-editor of The Routledge Companion to Media Fandom (2018), an anthology that brings together an international and interdisciplinary collection of nearly 60 established scholars to reflect on the state of the field and to point to new directions in fan studies research. Her scholarly work has appeared in the journals Transformative Works and Cultures, Cinema Journal, New Media & Society, Participations, Feminist Media Histories, and Critical Studies in Media Communication as well as numerous anthologies, including Fandom: Identities and Communities in a Mediated World (2nd Edition), How to Watch Television, The Participatory Culture Handbook, and Cylons in America: Critical Studies in Battlestar Galactica. In 2012, she was selected to represent the current generation of fan scholars to interview Henry Jenkins for the 20th Anniversary edition of Textual Poachers. She has guest blogged for the Cinema Journal Teaching Dossier and in media res, among others.